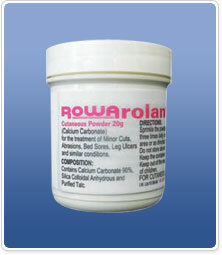 In addition to minor wounds, Rowarolan Powder is particularly valuable in the treatment of pressure sores and leg ulcers in the elderly. Rowarolan Powder acts as a moisture absorbent and as a skin protection. The powder does not irritate healthy skin and by neutralising tissue acidosis pain is relieved. Clean wounds with running tap water, saline or an antiseptic and sprinkle Rowarolan Powder onto the wound as directed. over 10 years of age Sprinkle the powder at least three times daily on the affected area as prescribed by the doctor.